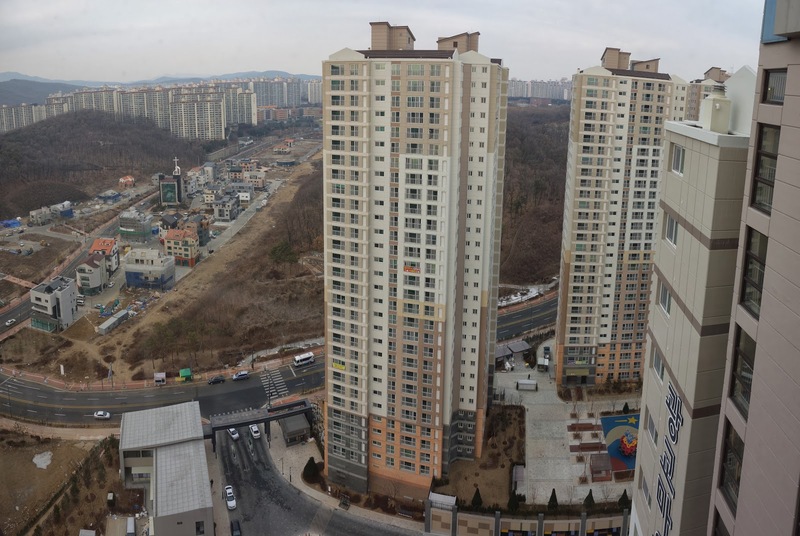 I spent the last 3 days visiting my in-laws in their modern new apartment located south of Seoul in Suwon. The apartment complex has around 8 brand new 29 story buildings in total and so far only a hand full of families have moved in, so the place is pretty much deserted. First stop. The huge (empty) underground car park. I wish I had a bike or roller blades. It would have been fun racing around. We got in the elevator to go upstairs and.... bang.... shudder.... stop.... The elevator was stuck. We pressed the emergency call button, spoke to someone, and waited. Then we waited. And then waited some more. We forced the elevator door open, but we were stuck between levels and couldn't go anywhere. Eventually someone came to help us out. Finally, we made it to the apartment. It is quite nice and filled with all kinds of gizmos and doodads. In the master bathroom you can answer the intercom or open the front door while taking a dump. In the living room is a nice big touch display that lets you check messages and the weather, control the gas, lights, heat, ventilation and water, receive security notices and even make phone calls. Below it are more ventilation and lighting controls (on the left) and heat controls for the room. Every room has its own individual heat controller which is a nice change from the older method of experimentation between the temperature setting on the thermostat and changing the ondol taps under the sink. All the light controls in the house are capacitive buttons. By the front door are a set of controls to turn off all the lights, shut off the gas and call the elevator (so you don't have to wait in the cold hallway for the elevator). The kitchen is not immune from technology. Like the rest of the apartment, it is packed with features aimed at improving safety and energy efficiency. For example, if you are washing vegetables at the sink and have both hands full you don't have to leave the tap water running. You can turn the water on and off via the foot pedal in front of the sink. There is a TV in the kitchen, but it is more than just a TV. You can also make calls, buzz people into the building, or listen to the radio. The stove isn't immune either. It is quite small, but in the top right corner of the picture you can see a small electronic gizmo with red and green lights. That is meant to detect gas leaks or excessive heat (kitchen fire) and shut the gas off. The kitchen/living area is a large open plan space. All the windows are have these air vents built into the top of them to help keep the apartment well ventilated. There is also this emergency descending life line, though it would take some balls to use it from the 29th floor. No Korean apartment would be complete without a large shoe cupboard by the front door. This is the second bathroom. The toilet has enough controls to fly you to the moon and back, and the hot water for the bath and shower can precisely control the temperature for you. The master bedroom has it's own private bathroom and dressing area, which Jihyeon fell in love with. This is Jihyein's brothers bedroom. And this will be Jihyeon's sisters bedroom. Here is another nifty gadget. It is always a pain to unplug things when you are not using them, and unlike in Australia there are no power switches on the power points. This power point has has a remote control dongle which can be placed in a convenient location to turn the power sockets on and off. After checking out the apartment, we sat down to a feast of Samgyeopsal. Gift from Australia in use. The next morning I explored the outdoor facilities. 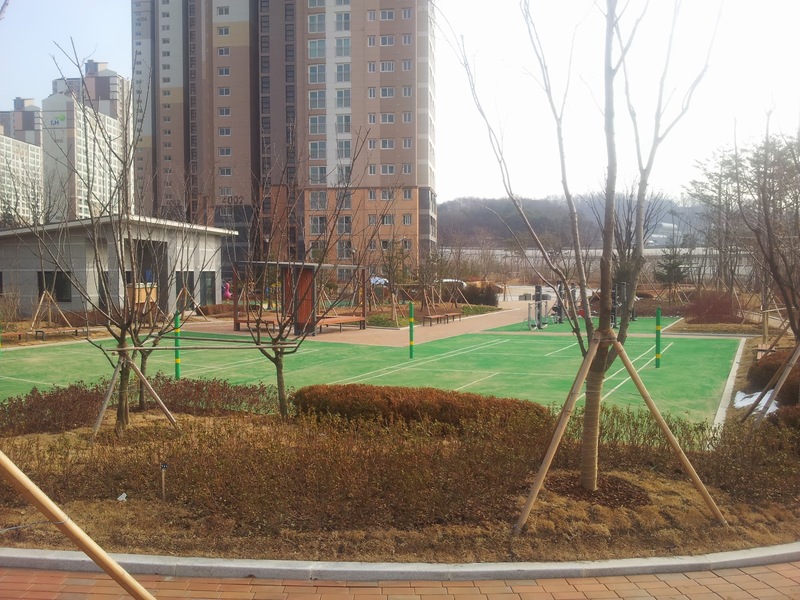 There is a badminton (this sport seems really popular in Korea) and outdoor exercising area. People are slowly moving into their apartments. Jihyeon thinks that once the lunar new year has been and gone, there will be a crazy rush for people to move in. In Korea these elevators are used to quickly transport furniture and other belongings up apartments. I'm not sure how high they can go, but i've never seen one go higher than 18 stories. I wonder if stuff ever falls off. The landscaping around the buildings is very professional. I can't wait to see it in the warmer months when they fill it with water. We climbed up to the roof to take a picture. I think my in-laws have done well with their new apartment. I can't wait to visit again in the warmer months and use it as a base to explore Suwon.